We had a light week back to school. We're all still pretty sick around here and so we just wanted to take things easy. We only covered a few subjects each day. There was not one single day this week that someone wasn't lying on the couch; complaints ranged from headaches to sore throats to belly aches. I won't lie... it was a L---O---N---G week and I kept hoping and praying that we'd get beyond being sick. I am so excited at the thought of going out later, even if it is to grocery shop. Luckily no one was so sick that we could not do school; in fact it was a great way to fill our time up. 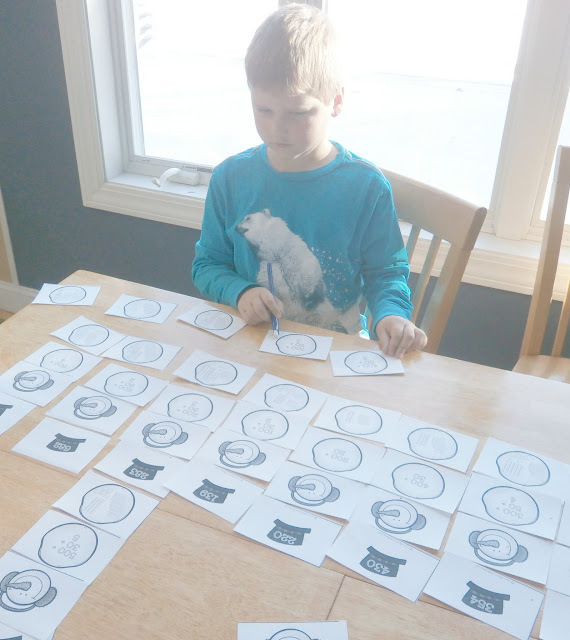 Math-- Evan spent one morning matching up these free printable place value snowmen. He also worked on some dot to dot pages that went by 2's to go along with the multiplication facts we're covering. All three boys worked on at least 8 more pages in their math books. Evan is learning multiplication and continuing to work on addition and subtraction. Ian is slowly making his way through the Key to Percents and the Key to Decimals. We're finding that working in book 1 of both books that there is a lot of overlap and he's really enjoying them both so far and that they're so easy. Alec had me go through his book and mark the easier pages for him. I'm debating about buying him a different book though; I wasn't thinking how discouraging it would be to get a 5th and 6th grade combined book that is so large and thick. It doesn't seem like we've even made a dent in it. All thee boys spent one morning playing with our elastic band and geoboards; making up fun new designs and shapes. I'm trying to be more purposeful in strewing items we haven't used in awhile. They also worked for hours (ALL TOGETHER) one day on their Lego sets; they are huge Lego fans and all got a lot of new sets for Christmas. It's great math/logic fun and when it helps them play together for hours on end without fighting it's just priceless. I never interrupt that time; even for school!! Reading-- Alec spent Monday (and Thursday) on the couch complaining of a stomach ache and read the entire book The Last Straw in the Diary of a Wimpy kid series. I was surprised to see him reading something so different from all of his other books. He must have liked it though because he read The Ugly Truth another day. Ian finished up Diary of a Wimpy Kid Old School this week as well as reading a few picture books: I drive a Backhoe, I drive a Crane, and I Drive a Tractor. Evan read Scooby Doo Spy Hunt, The Underpants Zoo, Starry Safari, and Green Eggs and Ham. We set their bedtimes back a half hour to allow time for reading before bed (something we've totally let slip) and I found Evan re-reading Biscuit's Big Friend and looking through one of his Minecraft Manuals sounding out words. Alec decided to use that time by starting another new book; Fablehaven; book1. Ian chose to just go to sleep. Sight Words-- I've been having Evan read through our sight word lists. 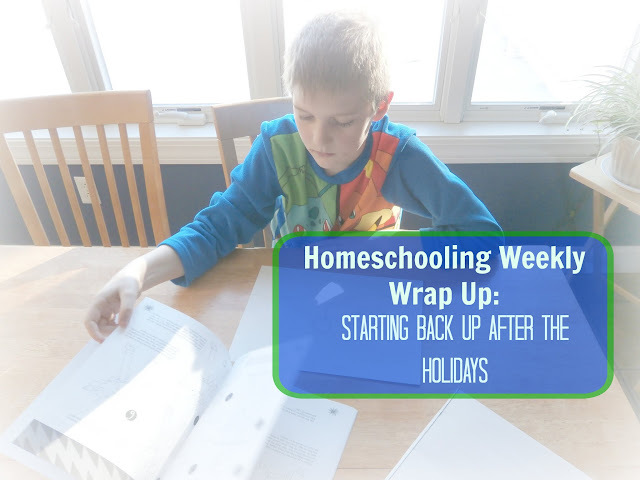 We haven't been practicing them or play sight word games with them for a long time and I was hoping to see if just reading with him has been enough to help him develop more skills or if we should go back to playing more sight word games and activities. At the end of Nov. he still needed to learn 10 words across the three lists we're working on and as of now he only needs to work on 5; so I think for now we'll just focus on reading with the occasional sight word game thrown in just for fun. Writing/ Language arts: Evan completed another two pages in his Star Wars book learning about ir, ur, and er sounds and then another two pages working on or, oar, ore, & oor sounds. All three boys completed a year in review worksheet; reflecting back on 2015 and looking forward to 2016 with some simple: I want to try, I want to stop, I'd like to visit, and I want to continue prompts. This is the first week we've decisively added writing back into our daily routine and so far it's going OK. The day we used our Draw Write Now books went fairly well and they quickly completed a worksheet on the homophones to, too, and two. We tried another writing activity where they took turns blindly building onto one another's stories. It was fun and funny and definitely something we'll try again. They were begging to start another story!! We got some new writing books in this week and tried that out one day: Unjournaling, and Fun School Spelling Journal (which has writing and spelling activities inside). I made the mistake of only ordering one Fun School Spelling Journal thinking Alec would enjoy it; but it turns out Ian would like to give it a try to so for now I'm photocopying the pages and we're putting together a binder (which is totally allowed with this series of books!). The boys had a lot of fun coloring, copying and memorizing. They really like that the book starts out so simple and fun! Art-- Alec got the book How to Draw Pokemon for Christmas and he spent one afternoon making some pictures. We also spent a morning using our Spot the Differences Art Masterpiece Mysteries book; it's such a fun series for exposing kids to art masterpieces. We pulled out some scratch art papers and worked on making some pretty pictures using Pinterest for inspiration. Cross- Curricula-- We spent two nights playing Alec's Trivia Crack board game honing up on facts in sports, science, art, geography, history and entertainment. Science/Technology-- Alec got a second bird feeder for Christmas that the birds ignored for a week or so. Now between the two feeders and our birdseed ornaments that we've hung off of them, Alec's windows are filled with birds! We've had so much fun watching them and identifying them. We've detected patterns in which birds prefer which seeds. It's great! Geography-- We've started talking about possible geography fair topics and have started researching Myrtle Beach (where we think we'd like to go on our family vacation this year). We also spent an afternoon looking at the Most Enchanting Spots of the 50 States. These slideshow type photographic sites are a great way to get my kids excited about geography. Self- Help/ Life Skills-- We've gone back to writing up a bi-weekly dinner menu. At dinner one night this week we took turns going around the table with each person picking two to three meals to serve in the next week or two. Usually whoever picks the meal helps make the meal and since it's something they enjoy eating they're more than happy to help. We used this wonderful yearly printable from Simply Stacie. I found Ian organizing his room one morning. He took his three ring binders of Lego booklets, dumped them all out and sorted them according to sets; keeping all the Lego City sets together, all the Lego Chima sets together, etc. and then put them back into the top loading binder pages keeping the ones he uses the most in the front. It's such a small thing but I love seeing him take ownership of something and finding a way to organize it that makes sense to him. We've used most of the Star Wars workbooks they have some pretty fun math and reading ones for grades k-2.